The vinaigrette acts as a quick no-fuss, yet perfect, marinade for the steak in this simple two-ingredient recipe. Pour vinaigrette over steak in shallow dish; turn to evenly coat both sides of steak with vinaigrette. Refrigerate 4 hours to marinate, turning after 2 hours. Heat greased barbecue to medium-high heat. Remove steak from marinade; discard marinade. Grill steak 7 to 8 min. on each side or until medium doneness (160ºF). Transfer steak to cutting board. Let stand 10 min. before cutting across the grain into thin slices. Season grilled steak with freshly ground pepper to taste before serving. 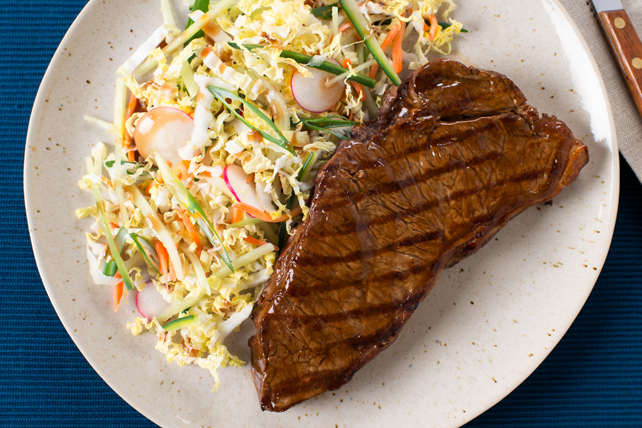 Serve with coleslaw, or a mixed green salad tossed with your favourite Renée's Vinaigrette. Marinate the steak in a resealable plastic bag instead of in the glass dish. Discard bag after use.